In the world of home improvement, some projects are inspired by great designs and others strictly out of need. For some time we have had a very small leak in our roof. Three different times we had roofers out and three different times it leaked again. FINALLY, we have the roof fully repaired and now comes the not so fun part – fixing the ceiling. It makes me sad to post such an ugly picture, but you have to see the beast I was up against. This nasty stain had to go. When we moved into our current home we knew it was a fixer. Dated cabinets, wallpaper and popcorn ceilings are certainly not en vogue. 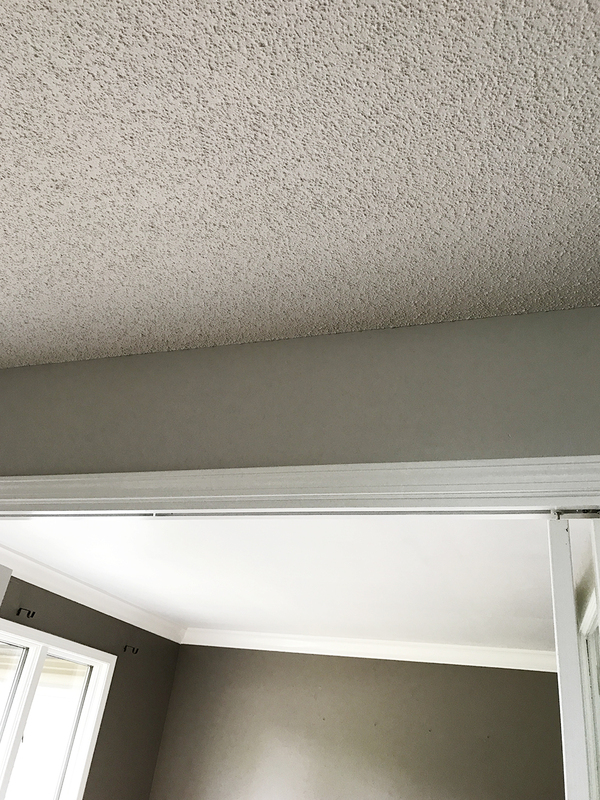 Confidence from many past home renovations had me convinced the cabinets and wallpaper would be no match for me, but I had never dealt with popcorn ceilings before. My hubs and I got a quote to remove them prior to moving in but after the quote was received it was clear we would be doing it ourselves or living with it. Five years later the job was still hanging over our heads (no pun intended). I knew it was going to be a bit of an undertaking but I had done my research and knew how I was going to tackle it. (gotta love the goog’s). 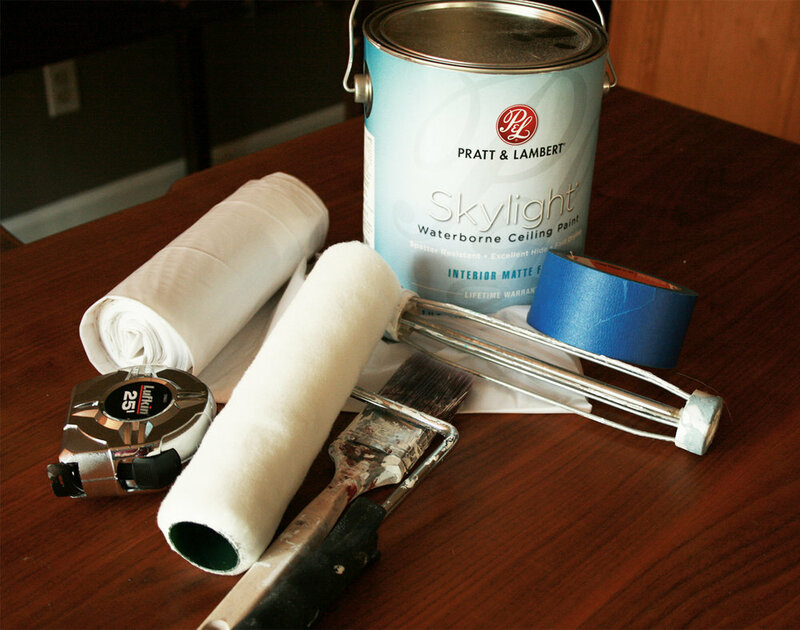 I was pretty sure that the mess I was going to make would be one of my biggest adversaries in this fight so I ran off to Bloomington Paint and Wallpaper and purchased a good, high quality, ceiling paint and plastic sheeting to protect the furniture and floors. Prep work is my least favorite part of any project. I just don’t have the patience for it. I very often regret not taking more time on this stage. For this job I would suggest removing all possible furniture and taping down plastic sheeting to cover the entire floor. This is NOT the type of job where you can just drag the drop cloth along with you. This stuff is horribly messy and you will regret it if you don’t take your time protecting your belongings and floor. After getting the area prepared I pulled out my sprayer. Most households have something similar they use to spray herbicide or stain the deck. Make sure the sprayer is well cleaned out and fill it with water. Spray a healthy amount of water on the ceiling and use a plastic or metal puddy knife to scrape away the popcorn but be careful not to gouge the drywall beneith (I find a plastic knife is less likey to cause damage and is lighter to handle). Move along the ceiling, spraying then scraping one section at a time. 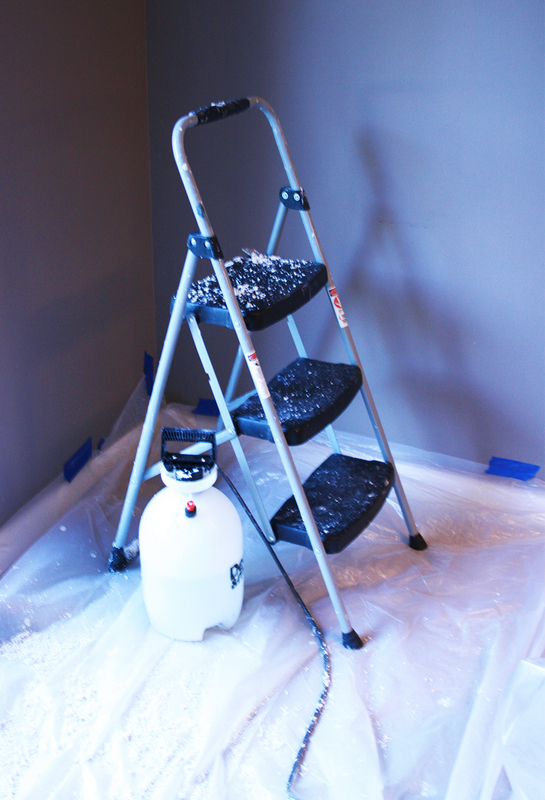 If the popcorn doesn’t come down on your first go, spray it again. You need to really get the ceiling wet for this to work. You can see above my work in progress. All in all it didn’t take too much time for me to scrape the whole room. After all the scraping was complete I cleaned up. That popcorn becomes a big sloppy mess and will get everywhere. I removed the plastic from the floor and wiped down my baseboards, sills and walls. While you’re in the cleaning mode, work your way up to the ceiling with a soapy bucket of water (I just use hot water with a bit of dish soap). 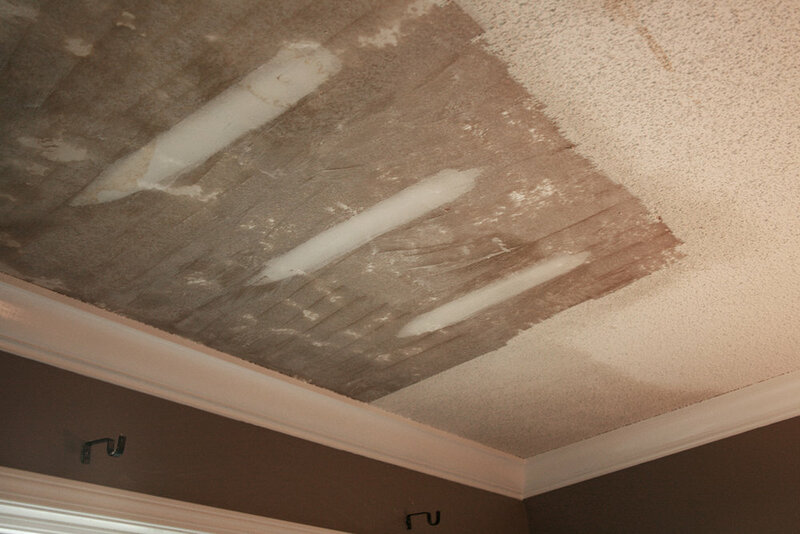 Use a rag to wipe away any remaining bits of texture and wash the ceiling clean. You’re half way there!! From here on out it’s just a standard paint job. 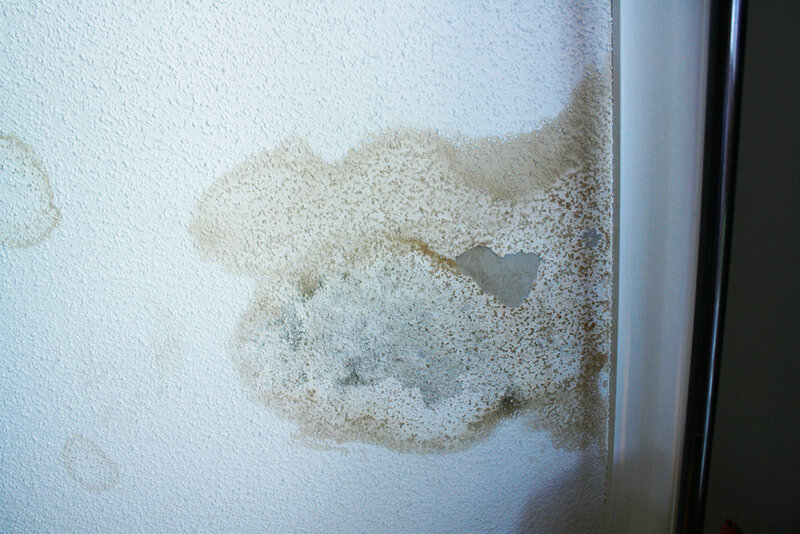 After the ceiling completely dries be sure to look it over carefully. Any gouges or damage needs to be repaired. 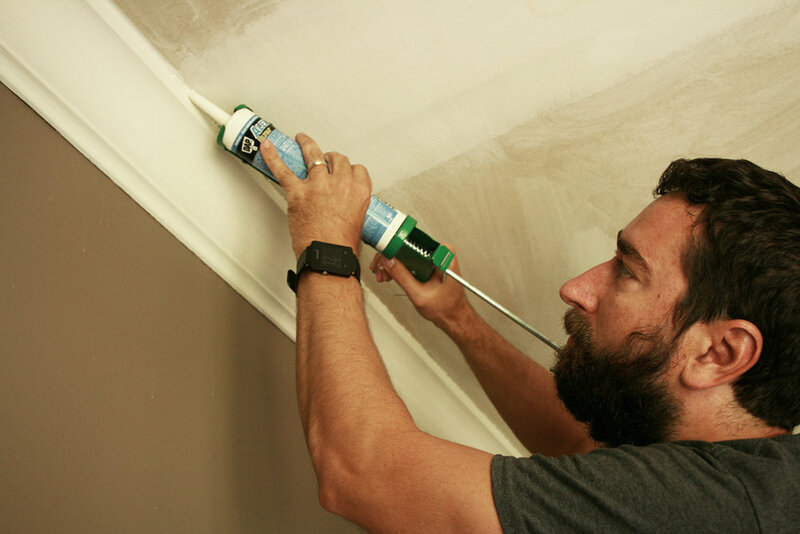 Use joint compound with your trusty puddy knife and get those little areas perfected. (TIP: Instead of sanding after you patch a hole try just using a moistened rag. It makes less of a mess). During this stage I also suggest doing any caulking necessary. Caulk can make a mediocre paint job flawless. I use it on baseboards, crown molding and door and window trim. 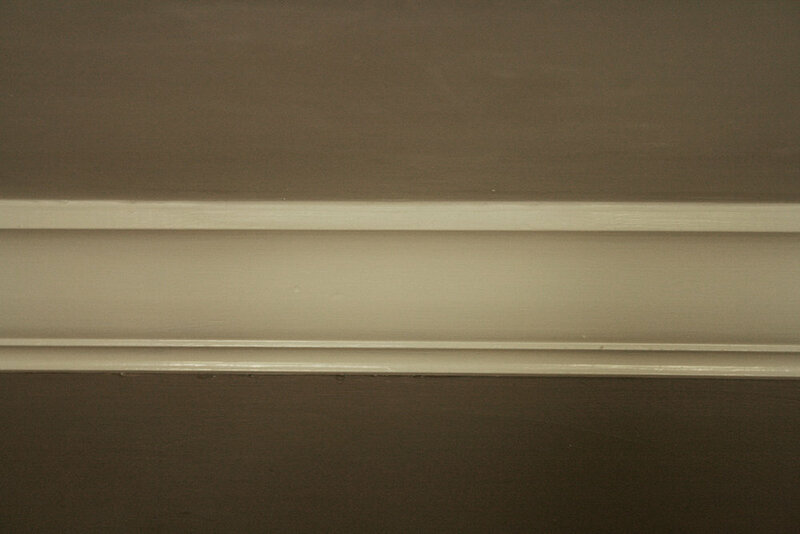 The caulk will fill any gaps leaving a nice clean line. I talked my handsome hubs to helping out here. 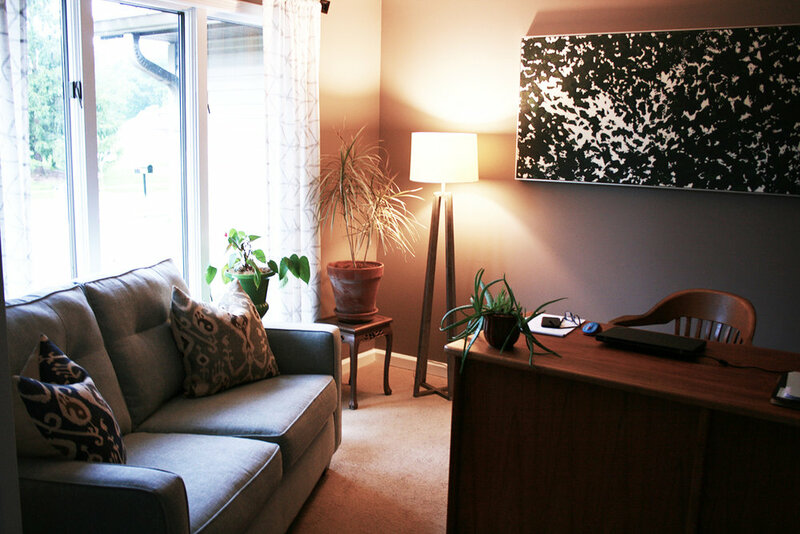 Check out this before and after. You can really see how much of a difference that simple line of caulk can make. This job did require a coat of primer sealer as well as two coats of paint. I will warn you here as I have before. Don’t skimp on paint. Buy a quality product and you won’t regret it. 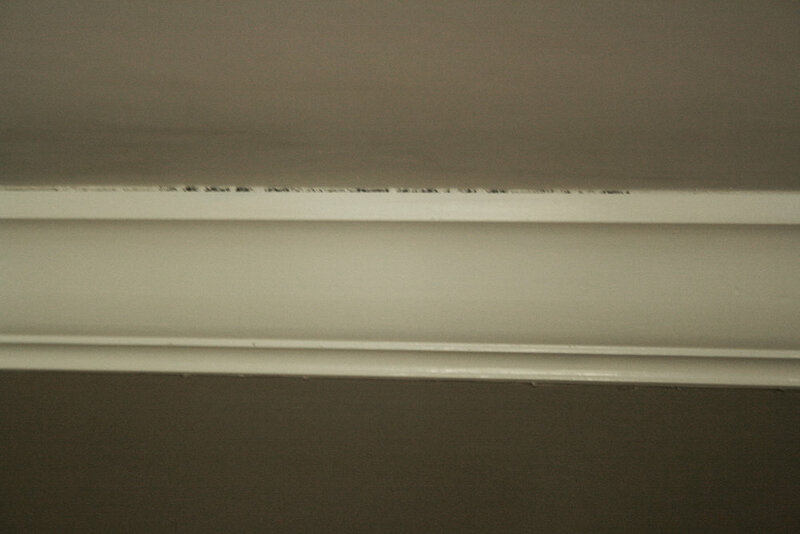 With a job like this one where I am covering a leak, having a primer that is also a sealant is crutial. 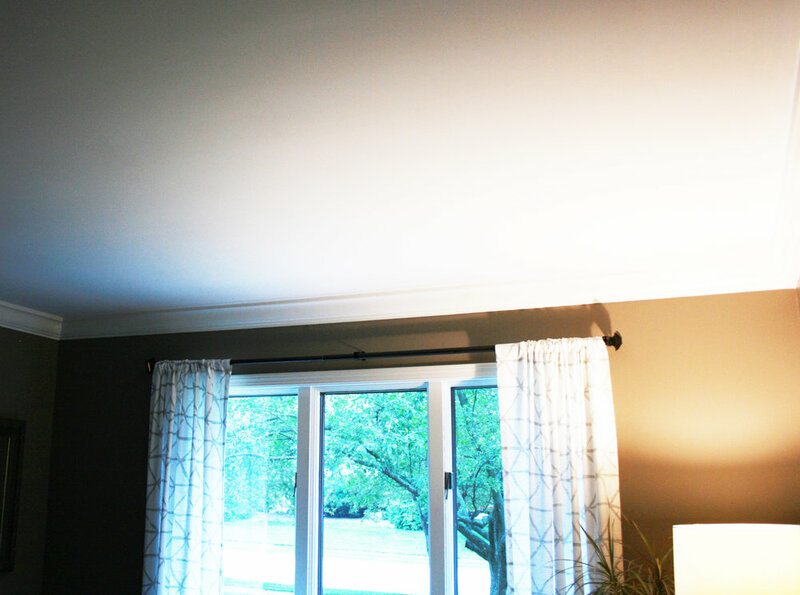 I went with a standard Pratt & Lambert flat white ceiling paint here, although experimenting with ceiling color can be a ton of fun. Having to fix up my ceiling gave me an opportunity to also re-arrange my office. 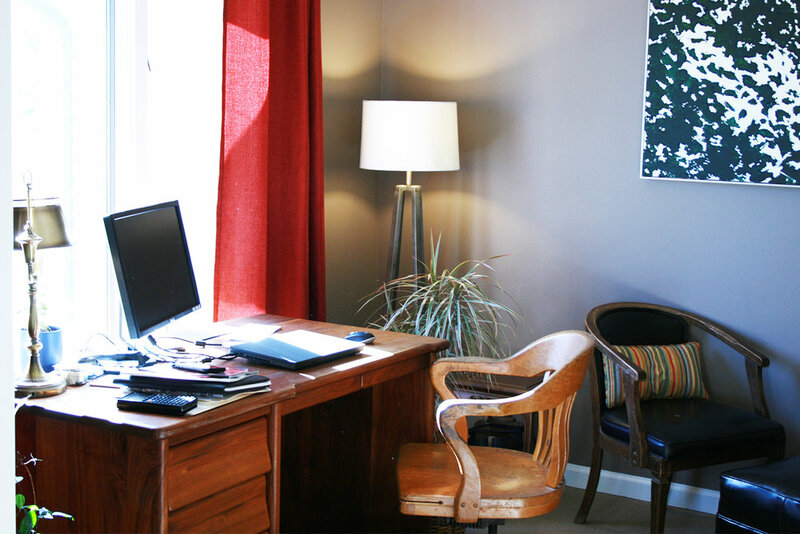 Here’s a before and after of my home office space. My office before. Nice, but a little cramped in the corner and my black chair and ottomon was never very comfy. Finally the textured ceiling in my home office is no more! My office after. Now I have more room to move around AND a couch to lounge in when I get sick of my desk. Here’s my home office next to my hallway ceiling – how will I ever stop! All in all I have to say that I think this was an easier job than taking off wallpaper. The biggest pain is working over your head. I am so glad to have this behind me but have to say I’m a little concerned with how many nights and weekends I’ll spend scraping away at the rest of my home. Send me a note or give me a ring if you have any questions at all. Don’t be intinimated… so many of these home improvement projects are just about digging in. This was a very low skill job – just time and a few supplies. Happy Homeowning!